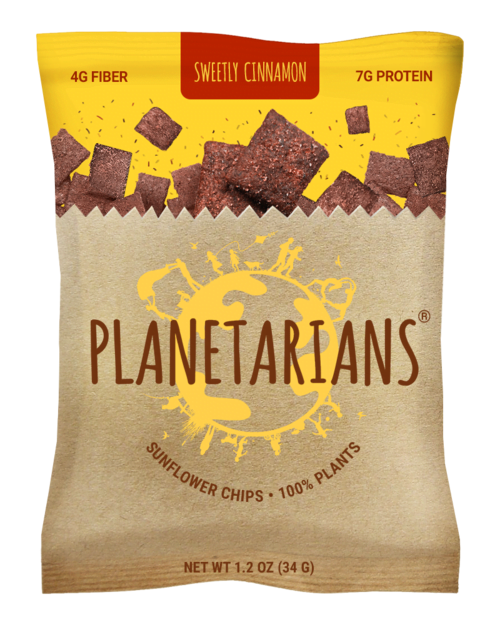 100% food are back, it seems, but in the new guise of ‘Planetarians‘ and with an interesting new product – crisps (chips to our US friends). By producing one blend, second, third…we lost our focus. And now we realized that we drifted away from our mission. That is why we have to announce the closure of Space Nutrients Station. It’s true, the extra blends made for a somewhat confusing product line, but only slightly, and it’s great to see that since closing 100% then team have stuck to their ideals and haven’t given up on trying to change the world. I’m not sure when these launch(ed) but they’re available on Amazon in three flavours (Sweet & Smoky BBQ, Sweetly Cinnamon and Fiery Sriracha) and I’m keen to give some a try. Crisps are a guilty pleasure of mine and with 300% more Protein, 200% more Fiber and 70% less Fat per serving than typical potato chips this could be quite a healthy snack. Ingredients are all natural, of course, and include Sunflower meal (50%), Organic Whole Grain Brown Rice Flour, NON-GMO Tapioca Starch, Sunflower Oil, and Seasoning. So a lot of boxes ticked. The saving the world angle? They’re Gluten-free, Soy Free, Lactose Free. Low GI, Vegan, Kosher and Allergy-free – and mostly made of up-cycled Sunflower Meal, which is left after oil extraction from seeds. So where as normally more than 50% of grown plants isn’t usually used during food production (their figure), Planetarians production methods uses 100% of a plant and other food recycling to create affordable healthy meals for growing population. For more information visit Planetarians here.